Hamilton Manufacturing Inc (HMI) is a family owned and operated cellulose insulation, hydromulch, and dust control products manufacturing facility and is one of the first of its kind in the US. In recent decades, the advantages of using these products have increased, and the company has continued to be an industry leader in the formulation and manufacturing of recycled cellulose construction supplies. HMI manufactures 100% bio-based erosion control products that are comprised of recycled cellulose and serve as a great medium for turf seeding and short-term erosion control. Premium NaturesOwn® hydromulch products include a non-toxic guar-based tackifier that assists in adhesion of the mulch to the soil and/or a bast fibre, which creates an intricate web after application to provide long-term erosion control or remediation. NaturesOwn mulch products have an increased loading capacity compared with other wood products in their class, which reduces water usage and other costs. Projects can be covered quickly with easy-to-use, long-lasting products that both conserve water and enhance germination. The ease of handling, high-loading capacity with smooth mixing, seamless application, effective results and cost savings make NaturesOwn products a preferred product among contractors and specifiers. Large-scale erosion control testing performed by TRI Environmental shows that the NaturesOwn range is 99.7% effective against erosion, and the products are the only 100% proven bio-based hydromulch solutions listed on the BioPreferred-designated product list for US Federal Procurement. HMI’s dust or erosion control products are economical and competitively priced with other products in their class. They also reduce costs from water usage, fuel and manpower. The company enhances the client’s return on investment by offering high-quality customer service from a team of experts to help implement projects, as well as a programme to help determine the best products for the client’s needs. Our programme is a complete evaluation to capitalise on the most cost-effective way to solve errant on-site dust or erosion issues. HMI’s dust control products are biodegradable, earth-friendly, and non-hazardous to the environment. Suitable for mining areas, industrial, construction, municipal, and agricultural applications, roads treated with our products will remain re-workable, allowing customers the ability to repair road surfaces easily when required. Loose dust is quickly penetrated and the products remain actively effective on clay, sand, gravel, limestone and most native soils, regardless of the weather or traffic patterns. As a result, they reduce water usage, labour costs and manpower required. 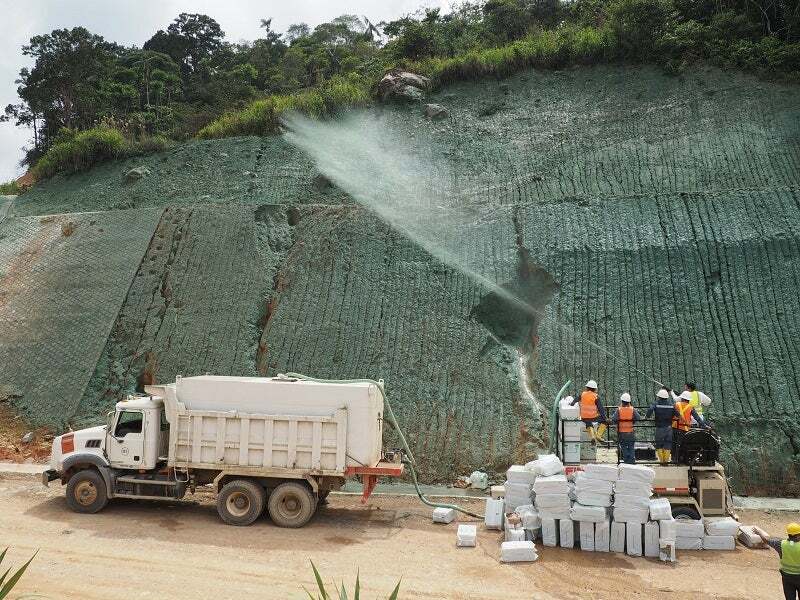 Our dust control programme trains operators and management to ensure proper application of the product in order to ensure high levels of performance and quality. We assess the soil type, traffic pattern and environmental issues of each mine during our evaluation period to determine the appropriate intervals of Knockout application. We help to establish the proper application intervals for each unique set of circumstances at every mine we evaluate. HMI manufactures four types of cellulose insulation comprised of finely ground recycled cellulose and a non-toxic, naturally derived chemical that acts as a highly effective fire retardant. It can also be used in as a large-scale pest control agent. The Thermolok® products can be applied loosely or wet-applied as a wall spray. With more than 48 years of experience in the insulation industry, the company produces 100% of its insulation solutions in the US. HMI products are tested by third-parties, industrial-proven and designed by highly qualified engineers to meet the demands of the customer. Established in 1962, HMI provides services to projects in more than 15 US states and 30 countries worldwide. As erosion and dust control specialists, we strive to meet the individual needs of each customer to the best of our ability. HMI works hard to provide quality products and to develop new or improved items for the continually changing needs of our customers. In addition, the company strives to help protect and enrich the environment and ecosystems around the world. Our staff are highly qualified and provides the versatility that is needed to evaluate, design, and execute erosion and dust control projects of all types and sizes, they are available to answer questions, help develop plans, oversee test shoots, and follow your erosion and dust control project through to completion. Sourced from natural resources, KnockOut Eco Dust is formulated with highly aggressive hygroscopic materials, which are complexed with amino acids to bind the road material together and gather moisture from the air. The non-toxic Eco Dust can be applied for any dust control application and is safe for human contact and plants. The toughest agricultural fibres are combined with wood cellulose fibre mulch to create X9000 Bonded Fibre Matrix (BFM).